There was movement at the station for the word had passed around….. at long last something is happening on the Nomad. I always knew it would take a while at the auto electricians because Peter told me he needed it through winter as he is flat out looking after all the dealer’s jobs for the rest of the year. I just didn’t think it would be the following winter, a year later! 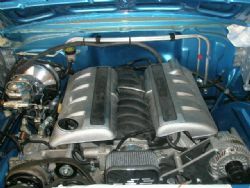 The good news is the engine harness is all done, wrapped up and installed. 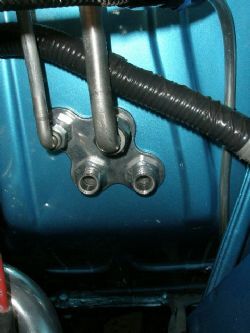 The air conditioning pipes are bent, installed and connected. 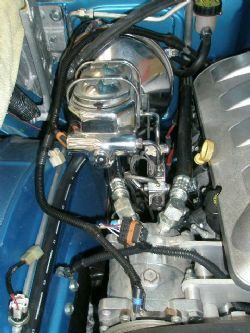 The four-hole bracket that allows the pipes to enter the car through the firewall is installed and all the plumbing from the condenser on the engine bay side is complete. The wires have been installed right through the car for all the electrical components and they will be pulled out, tidied up and reinstalled over the next three weeks. 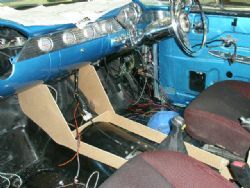 The fuse box is mounted, the computer has been reprogrammed and the leads for all the switchgear and accessories in the console have been run into place. As with any project, things change due to a variety of circumstances. The slow nature of this build has finally worked in my favour as I changed my mind on the audio system for the nomad. Initially it was a dash installed head unit and a separate ten stacker CD running through four side mounted speakers. The speakers remain the same, but the head unit and ten stacker have given way to a single disc CD, DVD, DTV, GPS and radio unit with a seven-inch screen that will fit in the console between the bucket seats. This all started with the purchase of an iMac, that led onto an iPhone, an iPod and...well, you get the picture. The iPod will do away with the need for a ten stacker which was causing me dramas due to its bulky nature and the need to put it somewhere. Under the seat, in the back, on the side of the console? In the end it was all too hard and it got the flick. The trouble and strife said it was about time I came to grips with new technology and this time she's on the money. The deadline for the wiring is the end of the first week in August 2011. I have an appointment with the trimmer this Saturday to go over the interior colours, materials and specs. With a lot of luck, undoubtedly more money and some focus the nomad may actually see the road around its fourth birthday anniversary in November. Am I dreaming? Watch this space.